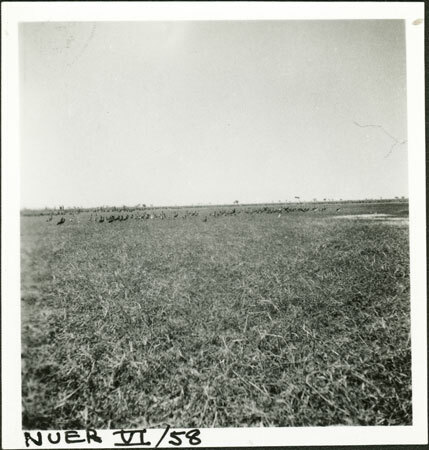 Looking across a floodplain towards a group of large wading birds in the distance, probably in a swamp in eastern Nuerland. Aside from documenting the natural environment in which the Nuer lived, birds were an interest of Evans-Pritchard's throughout his life. Note on print reverse ms pencil - "1 (5)" & print front border ms ink - "NUER VI/58"
Morton, Chris. "Birdlife in Nuerland" Southern Sudan Project (in development). 03 Jan. 2006. Pitt Rivers Museum. <http://southernsudan.prm.ox.ac.uk/details/1998.355.276.2/>.